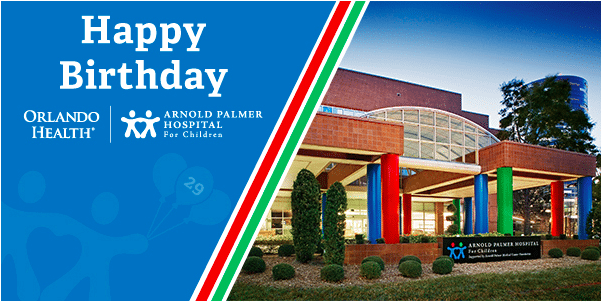 Help Us Celebrate: Orlando Health Arnold Palmer Hospital for Children Turns 29! Mark your calendars and help us celebrate the birthday of Orlando Health Arnold Palmer Hospital for Children. Dedicated on September 10, 1989, the late Mr. Palmer’s 60th birthday, the hospital continues to provide exceptional and specialized care just for pediatric patients. Orlando Health Arnold Palmer also offers specialized pediatric care for children in need of oncology or hematology services at the Haley Center for Children’s Cancer and Blood Disorders and for children needing nephrology care at the Hewell Kids’ Kidney Center. The Bert Martin Champions for Children Emergency Department and Trauma Center at Orlando Health Arnold Palmer was the first facility in the area to offer emergency care exclusively to pediatric patients and is part of the only Level One Trauma Center in Central Florida. In order to continue offering this high-level of care to the expanding community, Orlando Health Arnold Palmer recently started offering emergency services for pediatric patients at Orlando Health Dr. P. Phillips Hospital and will be adding similar pediatric areas to more of Orlando Health’s community hospitals and free-standing emergency departments in the near future. To help us celebrate and recognize the unique care offered by Orlando Health Arnold Palmer, make a donation today.